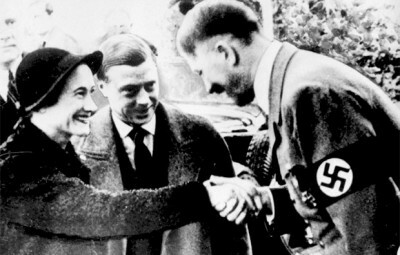 In 1937 the Duke and Duchess of Windsor visited Germany and met Adolf Hitler. Prince Charles’ “well-intentioned” remark comparing Russian President Vladimir Putin to Hitler is ironic considering the well-established fact the British royal family was cozy with the real Hitler back in the day. 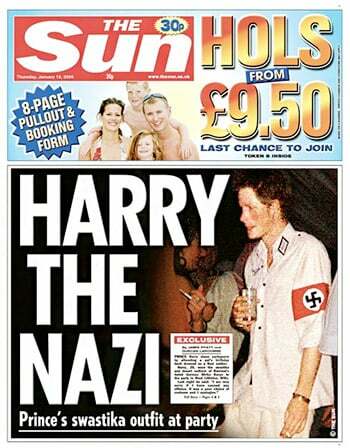 Prince Harry’s Nazi uniform, explained away as an unfortunate wardrobe malfunction in 2005, revisited a public relations disaster the royal family spent decades patching up. Following the First World War, the royal family changed its name from Saxe-Coburg-Gotha to Windsor to distract attention from its German heritage. Family members of Prince Philip, who is from the house of Schleswig-Holstein-Sonderburg-Glucksburg, were unabashed supporters of Hitler and the Nazis. Brother-in-law, Prince Christoph of Hesse, was a member of the SS. He piloted fighters that attacked allied troops in Italy. Several weeks before Germany invaded Poland King George VI and his wife, the late Queen Mother, sent Hitler a birthday greeting. “I never thought Hitler was such a bad chap,” said George’s brother, the former King Edward VIII, who became the Duke of Windsor after abdicating in 1936. Edward made this remark in 1970 when it was widely known that Hitler and the Nazis had directly and indirectly killed more than 40 million civilians and soldiers. Other royals were also connected to the Nazis. Baron Gunther von Reibnitz, the father of Princess Michael of Kent, was a party member and an honorary member of the SS. The brother of Princess Alice was a Nazi who claimed Hitler had done a “wonderful job.” Charles Edward was placed under house arrest after the war for his Nazi sympathies. He was sentenced by a denazification court, heavily fined and almost bankrupted. Much of the British gentry also held a fondness for Hitler and the Nazis. Lord Halifax was infatuated with Hitler and Sir Oswald Mosely served as the leader of the British Black Shirts. Montagu Norman, 1st Baron Norman, the Governor of the Bank of England from 1920 to 1944, was a close friend of the German Central Bank President Hjalmar Schacht. Schacht was an ardent supporter of Adolf Hitler and the Nazi Party and served in the Nazi government as President of the Reichsbank and Minister of Economics. Norman played a key role in transferring Czechoslovakian gold to the Nazis in March 1939.